It's the night before the carnival is to begin and Ken is missing, along with the charity money. Detective Barbie is on the case and needs your help to locate Ken and solve the mystery of his disappearance. With a library of over 50,000 names from which to draw, you can select your name and for the rest of the adventure Barbie will speak directly to you as together you try and find out what's gone wrong at the carnival! Targeted at girls from the age of five and up, this provides a learning experience by meshing problem solving, creative thinking and adventuring. 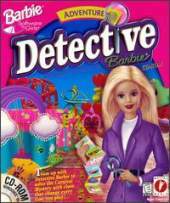 During the story, Barbie's friend Becky provides hints and you can store your clues on an in-game crime computer. As the adventure unfolds, you'll interact with various carnival rides, find secret passages and explore the surroundings. As your investigation continues, you'll interview a varied cast of characters, follow clues and experience rides such as the Tunnel of Love (in a fast watercraft) and the wild Bumper Cars. You'll oversee the park from high atop the Ferris Wheel and Carousel, leap into a free-fall drop on the Parachute Drop and race around on your own Rocket Ride. Played from a third-person perspective, it ensures that each new game will feature new clues and suspects. Help Barbie collect 50 clues to solve the mystery at the carnival. Explore 25 different colorful areas. Race bumper cars, ride the water slide, and sail the Tunnel of Love.